The park can be found by taking Guess Road out of Durham. The entrance is one mile after you cross into Orange county on the right. 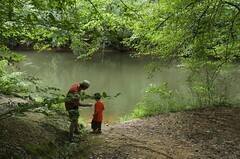 Great directions and wonderful information is found at the Little River Regional Park official web page. Likewise, you can use google maps from the embedded map below to create directions to the parking lot. Upon entering the park, several houses are visible along the park entrance. The entry road ends at a parking lot that has a small children’s playground and open play area on the left. Closed bathrooms, park office, and a covered pavilion is nearby. At first glance the differences between the bike and hiking trails are not obvious. 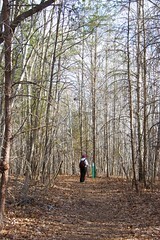 The hiking trails start by walking through the small, covered information building. I’ve marked the hiking entrance on the picture below. The trail begins on a concrete trail. The natural entrance of the trail is fairly well marked. 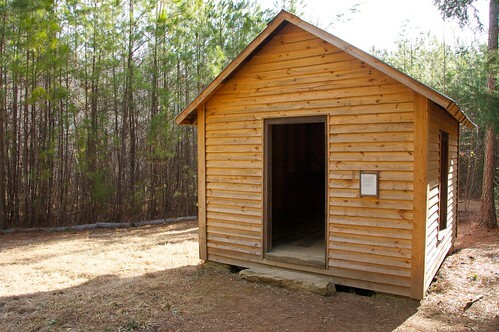 A small house that was used as a tobacco house and storage area is a brief focal point before the main section of the trail begins. 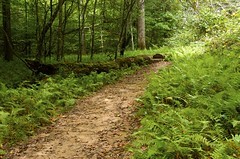 The initial Ridge Trail section of the hike is typical for the area with hardwoods and small pines. 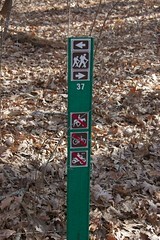 The trail is in excellent shape and well marked with signs. In the winter you easily get the feel that you are on a small ridge. Typical leaf-fall and downed trees are visible. 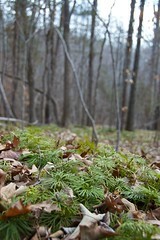 On the ridge were these small green fern-like plants that I love. They were covering one small section of the ridge. Measuring from the parking lot, the Ridge Trail is about 0.8 miles one way. On the way to the North River Trail you will the fork to South River Trail . Included below is an embedded google map of the GPS tracking of the trail and the various waypoints. You may have to click on the viewpoints to see their labels. At the end of the Ridge Trail, an information station and sign can be found. An emergency access actually forks here as well so it can be a little confusing. I’ve marked the proper direction of the trails below. 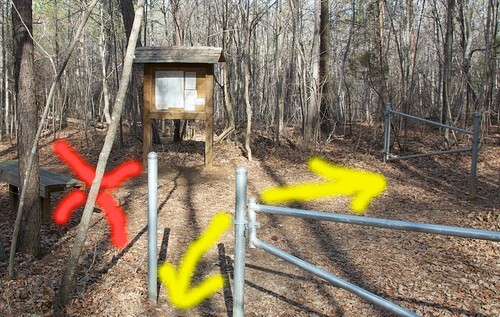 When in doubt, remember that passing through the metal trail protectors/gates is always the correct path. The North River Trail as you can see above is a loop that briefly parallels the Litte River. 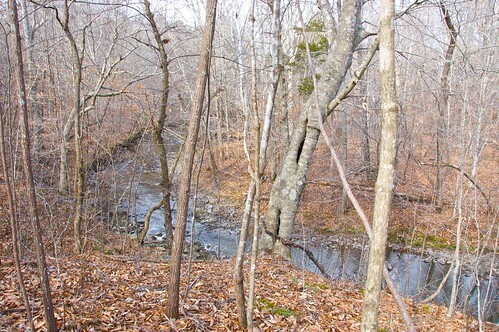 There is a minor climb down to the river and a subsequent climb back toward the trail. The Little River as a whole is certainly smaller than the Eno. It is typically shallow enough that young children can play safely, but it also brisk enough to create gentle babbling and tinkling noises around the rocks. Before long, the trail loops back on itself and you return to the parking lot via the Ridge Trail. Sit down and enjoy the wonderful, Little River experience before you head back home. 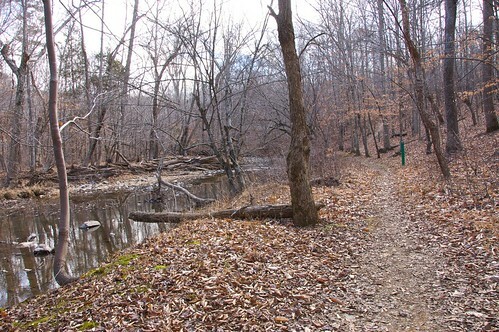 From the parking lot, you can hit either trail head for the Occoneeche Mountain Loop Trail. All of the side trails including Brown Elfin Knob Trail, Summit Trail, and Overlook Trail come off the northeastern part of this main loop. These side trails highlight some of the main aspects of the mountain and allow for a shorter hike. Trail maps are available from the parking area. For reference the northeastern start of the loop starts near the easily seen Ranger’s Residence. The western trail head of the loop starts past the public restrooms. 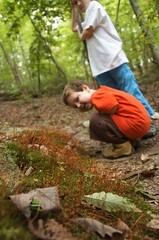 On our afternoon we hiked around the entire loop trail and did not tackle the shorter side trails. I’ll be describing the trail as starting from the northeast trail head. The trail starts with the fishing ponds on the right and veers off into the shades of the mountain forest. The initial climb peaks near the Brown Elfin Knob (767ft elevation) . The Brown Elfin Knob Trail forks off here and can be taken to the Summit Trail for a quicker hike to the Occoneechee Mountain Summit. We ignored these side trails on this trip. 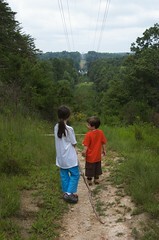 Climbing down the knob, the trail enters the power line cuts that borders the northern and eastern perimeters of the park. Although a bit unnatural, the power line cut is a good opportunity to appreciate how high the mountain is compared to the rest of the area. Continuing around the mountain, the trail next passes the Overlook trail. This internal side trail gives an top down view of the abandoned quarry. We bypassed this knowing we would have other opportunities as the loop continued. 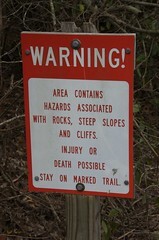 After another short hike along a power line cut, numerous warning signs mark a short, unmapped quarry trail. The views of the quarry here are very impressive. Children in this area should be watched closely as one wrong step could equal disaster. 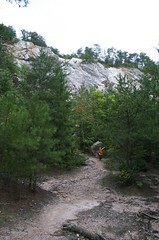 A bit further down, the trail opens up into the bottom of the quarry. 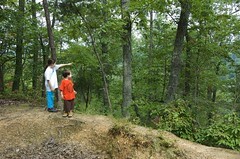 Kids will love exploring the large boulders and rocks left from the large rockslide in 2001. 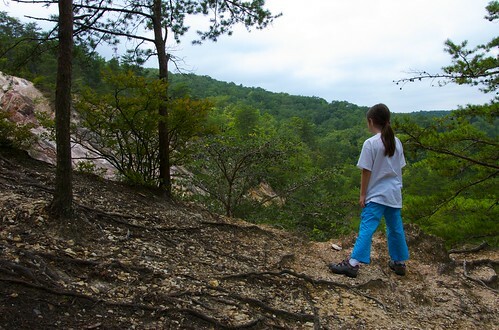 Leaving the bottom of the quarry will lead to the portion of the trail that parallels the Eno River. Near a small bridge take the time to explore the natural drainage from the quarry. The pyrophyllite mineral found here is often used in talcum powder. The soft talc-like quarry silky residue can be found on rocks in this drainage areas. 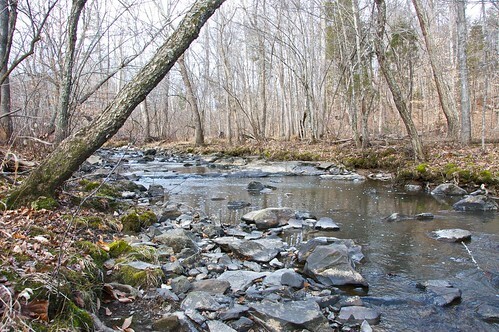 The many flat smooth stones here are also great for rock-skipping lessons with the kids. The western and southern sections of the loop are mildly strenuous as it wraps up and around the mountain. At one point the loop approaches the mountain summit (867 ft. elevation). The sound of Interstate 85 near the trail’s end signals your return to civilization. 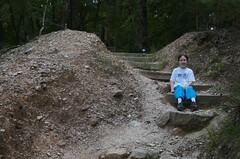 The quarry was started prior to the Civil War and was used to create railways in the state. It operating as the Southern Broken Stone Company until the early 1900s. The white face of the quarry is formed by the sericite, quartz and pyrophyllite minerals found in this area. The talc-like pyrophyllite continues to be an important industrial mineral. 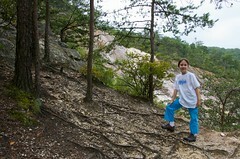 In fact, a nearby active modern quarry can be seen while hiking in the area. North Carolina remains a leading miner of pyrophyllite in the United States. Nothing fancy here. I just wanted to have a reference for all of North Carolina’s State Parks. I’ll add links and maps as I get time.